Birthday Hampers - Buy Online or Make Your Own? If your friend’s birthday is fast approaching and you still just don’t know what to get them, it’s time to stop panicking. Instead of buying one big gift why not combine all of their favourite things in a sweet and sentimental hamper? If you’ve never given a hamper as a gift before then don’t worry – it’s a lot easier than you might think. The only big question you’ll have to ask yourself is whether to do it yourself or buy your hamper online? There are benefits to both and we’ve summarised them below to help you make your decision. Making up your own birthday hamper for your friend is an extremely nice, personal thing to do. The recipient is guaranteed to love it but it’s worth noting that this can be a pretty pricey way of doing things. If your friend just loves a fancy bottle of plonk or has a dreadful sweet tooth, making up your own hamper means you get the chance to choose her favourites and you can even create your very own hamper basket to hold it all in! Whether you choose a white wicker one or go retro with a wooden box, you can decorate it how you like and ensure it matches your beloved friend’s personality and taste to a tee. You’ll also have the added benefit that you won’t have to wait for anything to arrive in the post because you can go out and choose all your hamper gifts yourself! Cons: Making up a custom-made hamper, even with own bought ingredients, can get a bit pricey. Decorations wise, you have to make a lot of effort to make the hamper look presentable. It is also more time-consuming. For those who favor cost and convenience but don’t want to sacrifice choice, buying hampers online is an obvious solution. Whether you don’t have time to traipse around shops or are on a tight budget, ordering your hamper online will ensure you get exactly what you’re looking for without ever leaving the house. 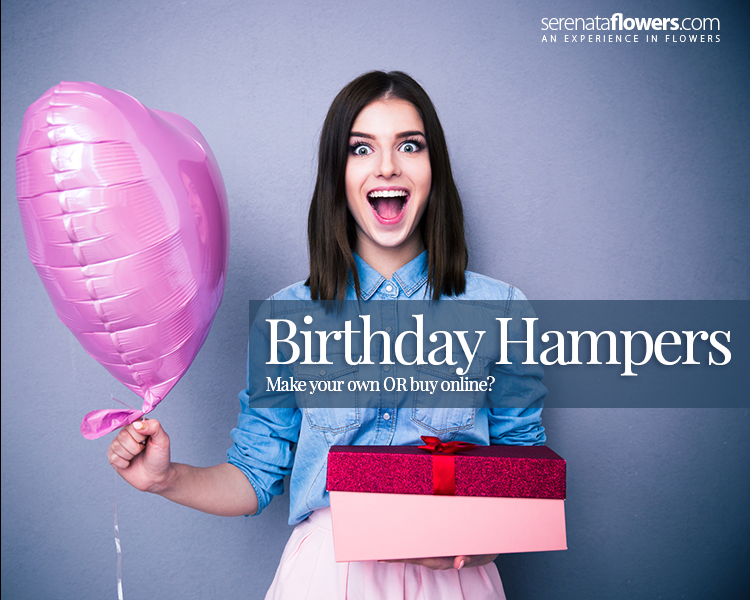 With the vast amount of hampers available online you’re sure to find the perfect one for your friend’s birthday. Whether they love teddies or are a wine connoisseur, a keen gardener or a self-confessed foodie; you’re sure to find the ultimate birthday hamper on the internet. Online hampers come with a great range of extras you can add too – from balloons and flowers to teddies and trinkets. What’s even better is as online sellers offer quick delivery services you don’t have to worry if you place your order a little late. Pros: Wide selection of wicker hampers, ingredients, add-ons and cards to complement your gift. Fast and free delivery straight to the door. Caters both for affordable gifts and those looking for something a bit more unique and luxurious. Cons: There are some limitations on delivery options, some very remote places can be excluded from delivery. Whether you decide to make your own hamper or buy one online, you also need to ensure it is right for your recipient. Accompaniments – hampers don’t have to be your only birthday gift to a friend. Accompany this special gift with teddies, flowers, chocolates and other special gifts to make it an even bigger threat. With these tips in mind, you can be guaranteed to give the best birthday hamper possible. Buy online for convenience that won’t cost you extra or make your own to guarantee complete control and personalization; the choice is yours.